The Government has followed a theme-based approach in formulating Climate Change Policy, 2075 (BS). The preliminary draft policy which circulated in mid-March 2019, includes policy, and non-separated strategies and working policies in 8 thematic areas, namely: (i) agriculture and food security; (ii) forest, biodiversity and watershed; (iii) water resources and energy; (iv) rural and urban settlements; (v) industry, transport and physical infrastructure; (vi) tourism and natural & cultural heritage; (vii) health, drinking water and sanitation; and (viii) disaster risk reduction and management. The draft policy also lists policies, strategies and working policies on: (ix) gender, social inclusion, livelihood and governance; (x) public awareness, education and capacity development; (xi) study, research and dissemination; and (xii) climate finance management. It considers the need for a new climate change policy to address national priorities and local needs in the changing global context. The draft policy focuses on ‘offspring’ – the Paris Agreement of the ‘mother’ Climate Change Convention. The strength of the draft policy, 2019 is the inclusion of guiding principles which are related to common but differentiated responsibilities and capabilities, need for internalization of climate change aspects in relevant policies, plans and programs, sustainable development, equity, public participation, coordination and cooperation, science-based decision-making, and balance between national priorities and international relations (with priority on climate change adaptation). The draft policy commits to implement it at federal, provincial and local levels by formulating necessary laws, strategies, working policies, guidelines, procedures, manuals and plans. It also commits, inter alia, to: (i) prepare a roadmap to the Paris Agreement, Nationally Determined Contributions, National Adaptation Plan and transparency framework; and (ii) establish a council on climate change for policy coordination at the national level, climate change coordination committee for policy and functional coordination at the provincial level, and climate change section or unit at relevant ministries at federal & provincial and local levels. Furthermore, the draft policy has made local levels responsible for formulating and implementing climate change-related local plans. The draft policy does not recognize the role of existing: (i) Climate Change Policy, established in 2009 under the chair of the Rt. Hon’ble Prime Minister; (ii) Climate Change Coordination Committee, established in 2011 under the chair of the Minister for Environment (then); and (iii) Multi-Stakeholder Climate Change Initiatives Coordination Committee, established in 2010 under the chair of the Secretary of the then Ministry of Environment. 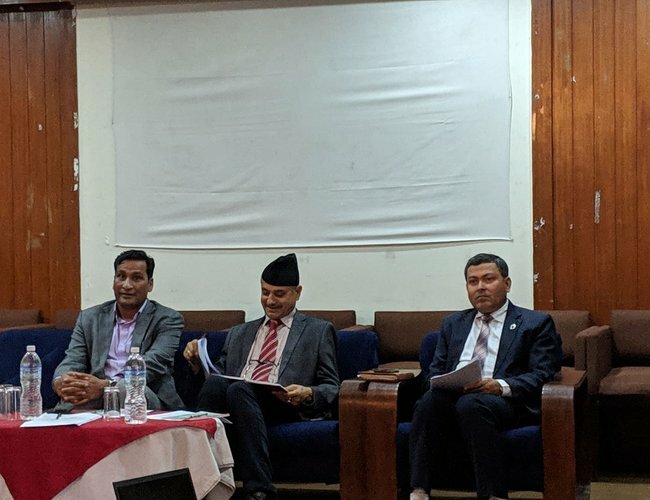 It gives the impression that this draft policy attempts to ‘erase’ the experiences and learning from 1994 to 2018 in addressing climate change impacts in Nepal, including through 2011 Climate Change Policy and other initiatives. This draft policy opens avenues to understand the ‘strategies and working policies’ and ‘climate and climate change’ as one likes. The draft policy neither reviews the state of implementation of the Climate Change Policy 2011 nor considers the most relevant policies of the then government led by UML. The 2011 Policy focused on climate change adaptation, disaster risk reduction, low carbon emission and climate resilience in any development sector that was and/or will be affected by climate change. Similarly, the 2011 Policy emphasized on capacity enhancement, public participation and empowerment, technology development, transfer and utilization recognized the role of the Climate Change Council, committed to establish Climate Change Center as a semi-autonomous technical body and Climate Change Fund, and channeled at least 80 percent of the total climate change budget to field level activities. This fund channeling policy was appreciated globally, including by over 400 participants from more than 60 countries attending the 8th International Conference on Community-based Adaptation to climate change in Kathmandu in April 2014. Previous commitment to channeling budget has been changed to ‘maximum share’ of climate finance to local level and has challenged the ‘2011 political guidance’. The draft policy has recognized the thematic and cross-cutting areas, as identified in mid-2016, for the formulation of the National Adaptation Plan (NAP). It has considered capacity building, study and research, and access to financial resources as focused in the 2011 Policy. The 2019 draft policy has not set targets like in the 2011 Policy. Adoption of theme-based approach has opened avenues for repetition of policies on adaptation, technology use, documentation of good practices, capacity enhancement, awareness raising, GHGs emissions, and use of clean energy or energy efficient or low emission technologies in relevant thematic areas. Working policies such as implementation of Chure management program, crop diversification, conservation of agriculture biodiversity and organic farming, reduction of forest fire etc. are also addressed in other sectoral policies. The draft policy provides unclear reflections on reduction of GHGs emissions or climate change impacts. The draft policy has nicely defined the role of the federal, province and local levels in implementing policies. Although the 2011 Policy has not been recognized, many of the working policies of this draft can be regarded as the ‘old wine in the new bottle’. It would have been appropriate to consider ‘low GHGs emission economic development’ as one of the guiding principles and objectives. It overlooks community-based adaptation. It recognizes the waste segregation at source but limits to produce only clean energy. It should open avenues to promote ‘waste-to-resource’ approach. Previous studies on climate change in academic curricula might have been overlooked. The draft policy overlooks the nationally and globally acknowledged ‘LAPA framework’ to help climate change vulnerable communities to adapt to and build resilience to climate change impacts. Although it attempts to list key 2015 initiatives (SDGs, DRR framework, and Paris Agreement), it should equally focus on the outcome of the Habitat III (2016) to align international initiatives and national priorities. In a nutshell, wider consultation and consideration of 8 years of experience, knowledge and learning in implementing the 2011 Policy would make it ‘realistic’, minimise the ‘erasing the footprint’ approach, and increase ‘ownership’.